I-Mockery At The E3 Expo! Yo ho ho, fellow mockers. I just wanted to let you guys know that we are at E3 again this year and will be posting an extensive photo gallery of the event later this week. In the meantime, you can follow any updates on our Facebook and/or Twitter pages. From playing the new Twisted Metal and Splatterhouse to meeting Captain Sig Hansen and watching a live Lucha libre wrestling match and more... this year's expo has been awesome. Way better than 2009 already. 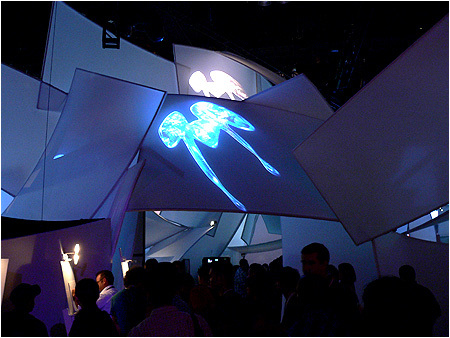 So for those of you who've been following E3, what have been some of your favorite announcements of the event so far? Did any companies really wow you? Were any of 'em underwhelming? Spill thy beans! Ooooh, Sig Hansen...he's my favorite captain after crunch. Natal (Kinect) isn't as bad as I thought it would be. But it isn't great. Donkey Kong Country is a surprise for me, excited about that. 3DS from what I hear, needs to be worked on due to having a really small window that you can view it in, in order for it to maintain the wow of the 3d. And really, it seems like a gimmick, but we'll see...everyone's going gimmick now...microsoft, sony, nintendo... Twisted Metal got me excited enough to pledge to buy a PS3 when it comes out. No other game that is PS3 only has done that for me yet. Zelda kind of made me sad. I was hoping they'd take the waggle aspect out of it, but now it's got motion plus waggle. I hate swinging my arm to swing a sword. Just let me use the buttons. Being a Nintendo fanboy is going to kill me this year. Granted, mostly I'm a Nintendo fanboy because I don't want to spend the money to buy two more systems and games for them when I barely find time to play my Wii games. DK, Zelda, Epic Mickey... I'm excited. And I want to try out the 3DS, though try before buy despite the ginormous list of games announced that appeal to me. For me the nintendo press conference was overwhealmingly awesome, with the exception of yet another mario sports title (why?). The other two... well they were pretty weak. 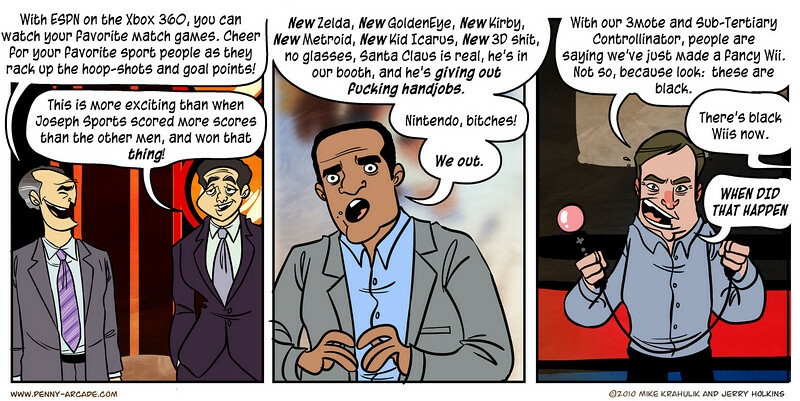 As the comic suggests, sony decided to blatently copy the wii and microsoft seemed to focus on stuff that totally alienates their average user. Kenetix looks like it'll be crap and while the ps3 rig looks like it might work, it'll cost you a small fortune for an accessory that probably won't get used on a lot of games. Congratulations on your appearance on Web Soup! Drunken_Lemur408, where's the footage of it? I didn't even know we were on there haha. I just loved the new trailer for portal 2. can't wait for that one.....not a fan of the art for the new zelda game....nor a fan of the new kirby game period.....and of course the new goldeneye game looks great!....even though it just screams "People liked a perfect dark remake so lets make goldeneye!" I think Microsoft and Sony have lost it. The Kinect looks like a piece of crap, and the Move is a Wii controller painted black. These guys want to be Nintendo so bad that they're dressing up as Princess Peach in their hotel rooms. Nintendo has...sequels. New Metroid, Kirby, Zelda, etc. They look good, but aren't exactly exciting (though knowing me I'll probably buy them all). I guess when you're at the top of the heap you get a little complacent. I will admit the 3DS looks awesome. A little...too awesome. I'm suspicious. Considering all the scorn most reviewers have has for Sony and Microsoft's presentations, I think maybe they were just so relieved by the 3DS that they are exaggerating a bit. I agree that the motion controller stuff that Microsoft and Sony are doing were pretty lackluster, but I don't think they've "lost it" per se. Nintendo is obviously the winner as usual amongst the fans, but I was most excited by Sony this year. Wait, I thought E3 was over on the 16th. It's still goin? yeahhh videogames!! games I've been wantin'! Hooray. Here's a thing.. if Sony and Microsoft had been all kiss-uppy to the Wii so far, I'd totally understand and praise their copying.. but since they've been looking down on it, it just makes me laugh. Even if their things work way better, it'll only be because they had years more to work on 'em. There aren't any titles coming to the ps3 except for twisted metal. Unless you are counting cross-platform games, but I'm not sure how you can translate that to exceitement for the ps3 lineup rather than just excitement for upcoming games in general. Twisted Metal wasn't really a suprise Rog... the info got leaked on the internet over two months ago, the TM team just lied and blatently denied it. I am VERY concerned about TM though. If we are being honest with ourselves, the first and last twisted metal game that was really any good was twisted metal II and that came out in the mid 90's. Every sequel since has been pretty lack-luster. I really hope they can pull it together this time, but I just don't see it happening. It's kind of like the goldeneye title for the wii. Sure goldeneye was awesome.... in 1998. Even with updated gameplay and graphics I'm not sure it will ever re-capture the thrill of the original. but if we go back even farther we get the Nintendo power glove which I belive was the first motion controller....yes it was horrible, never worked, and spent more time being the "giant robot hand" that my transformers would have to fight then being used for video games....but it existed. It was footage of your Human Centipede game. Twisted Metal and Little Big Planet 2 are the biggest ones I am excited about... I have owned every version Twisted Metal.. Including Small Brawl... And the only question I have what Twisted Metal universe is this? The original one that could take you all over the globe or the one from Black which had it's own special world with now famous landmarks to destroy? Sorry for the double post but forgot someting... Rog you and Boogie were interviewed about Twisted Metal for a PS# special download that can be found for free on the PS3 Network. Not sure what world as the demo was only contained within one town level. As for the PS3 Network video with us in it... yeah, we posted it on our Facebook fan page a while back. Thanks for checking it out though! Previous post: I-Mockery Human Centipede Game Interview On KROQ’s Kevin & Bean Show. Next post: Lloyd Kaufman Appearing LIVE On Doc Mock! Thursday, June 24th @8pm PST / 11pm EST! Enter Our Contest!